Unlike many teenagers, Bernard Loiseau knew from an early age what he wanted to do with his life, and that was cook. At an age when other teenage boys are chasing girls and playing football, he was already an apprentice at the renowned La Maison Troisgros, a restaurant that has had three Michelin stars since 1968. Having completed his apprenticeship, Loiseau went to work for Claude Verger at Le Barriere where the respected Gault Millau guide hailed him as a prodigy and one of the first proponents of nouvelle cuisine, the gastronomic revolution that was sweeping France and emphasised lightness and freshness over heavy classic French cuisine. In 1975 Verger installed Loiseau as the head chef of his newly-acquired restaurant, La Côte d’Or in Saulieu and gave him free reign to develop his highly personal style of cuisine. This style continued to develop after Loiseau bought La Côte d’Or from Verger in 1982, renamed is Relais Bernard Loiseau, and was awarded three Michelin stars in 1991. But in 2003, at the height of his career as one of France’s most commercially successful chefs but suffering from depression, Bernard Loiseau took his own life. There was some speculation that he feared the loss of one of his Michelin stars, but the star was never lost – all that was lost to the culinary world was the star that had been Bernard Loiseau. Bernard Loiseau was the first Michelin- starred chef to incorporate his business and trade its shares on the stock exchange and when he died, his wife Dominique felt she should keep the business running after his death so that his spirit and legacy could live on. The very next day she took over the reins of the business including her husband’s eponymous restaurant and placed Patrick Bertron, one of Loiseau’s protegés at the helm. The restaurant still maintains its 3-star status today. Another way in which Mme Loiseau sought to preserve her husband’s legacy was to team up with Constance Hotels to host a prestigious annual culinary festival at the five-star Belle Mare Plage resort in Mauritius. Each year, six European Michelin-starred chefs are flown to the island to compete in teams to compete in creating a starter and a main course with a Mauritian flavour. As Bernard Loiseau was known for being generous with his culinary knowledge, the theme of learning and sharing runs through the festival: all participating international chefs are paired up with an Indian Ocean island chef from a Constance resort and they cook as a team throughout the week-long festival. All spices must be prepared with the traditional “roche-cari”, a stone used for crushing spice ingredients; and candidates shop for their own fresh produce at Port-Louis so as to encourage creativity in design using only local seasonal products. Although only the jury (including Mme Loiseau and chef Bertron) taste the competition food, they can participate in cooking activities at the hotel all through the festival as well as being able to attend a special six-course dinner cooked by participating chefs. This year is a rather special year as it will be the tenth anniversary of the first Bernard Loiseau Festival Culinare. To launch this year’s competition, Constance hotels recently staged a European roadshow including dinner at the St James’s Hotel and Club in London to which I was invited. The achingly chic and very charming Dominique Loiseau herself was in attendance, and over glasses of vintage Deutz Champagne Brut 2006 we were treated to video footage from last year’s competition and interviews with past chef participants, all of whom talked of the irreplaceable experience of teaching and learning that the festival provides. For the dinner, Constance Belle Mare Plage executive chef Dominique Gral had flown over to team up with St James’s chef William Drabble (himself a former contestant at the festival in 2013) in preparing a four course meal for us to savour. After nibbling on the excellent bread and flavoured butters, and sipping the rather wonderful Chateau des Fesles 2011 Chenin Blanc (Loire), we kicked off with the first course: a wonderfully delicate veloute of palm heart with a seared hand-dived scallop and vanilla oil. The scallop was impressively huge, sweet and seared to perfection, with the crisp crust contrasting beautifully with the buttery interior. The palm heart veloute was seductive and silky, and I loved the sweet note of spice that the vanilla oil added. Palm hearts are a central feature in Mauritian cuisine and are a key ingredient at the Festival Culinaire Bernard Loiseau. If you want to try your hand at recreating this veloute at home, you can get the recipe from the Constance Hotels website. The next dish was my runaway favourite of the night: seabass with citrus, fennel, gratinated clams and lemon grass foam. Not only was it beautifully presented, but it also featured one of my favourite seldom-seen-in-London ingredients: a razor clam! I loved the crisp-skinned and well-seasoned delicate seabass and the nutty flavour of the gratinated clams – such a successful dish! 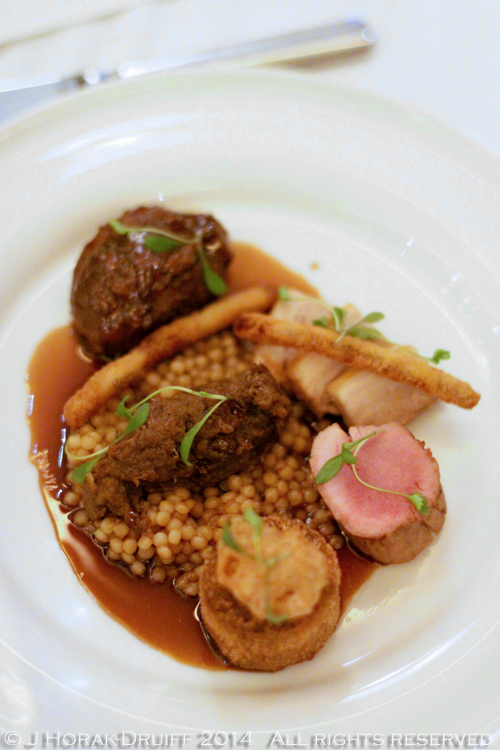 The following dish, accompanied by Chateau du Cartillon (Haut-Medoc) 2012, was another hit: Lune Valley lamb cooked 3 ways with curry spices, aubergine and giant couscous. I am always a succker for different takes on the same ingredient grouped together on a plate and this was no exception. There was fillet, belly and (I think) slow-cooked neck on a bed of nutty giant couscous and topped with a zingy aubergine paste – a fantastic combination of flavours and textures. All too soon it was time for dessert and continuing the theme of island flavours, this consisted of a pineapple and coconut bavarois with coconut sorbet. It’s hard to overstate the deliciousness of this dish. I loved the creamy richness of the bavarois and the zing of the cubes of marinated fruit, but my favourite aspect was dipping the crisp pineapple ring into the nutty toasted coconut sorbet. Heaven on a plate! And so the evening drew to a close, but not before we had a chance to meet the chefs, and to finish off with a coffee and some excellent petit fours served on cocoa nibs in a covetable lacquered box. Enjoying such excellent food and seeing the two chefs chatting so convivially seemed to me to be a very fitting way to launch this prestigious contest based on fine food and co-operation, and an excellent memorial to Bernard Loiseau. The 10th Bernard Loiseau Culinary Festival will take place from 21-28 March 2015 at Constance Belle Mare Plage resort in Mauritius. The competition pairs six Michelin-starred chefs with six island chefs from of Constance Hotels & Resorts for a week of collaborative cooking. The main objective of the Festival is to support the exchange of experience and knowledge of the participating professionals, and to gather chefs from very diverse backgrounds around a common passion: the love of cooking and the art of the table. All cooks of the Constance Hotels Group, from commis to Chef de partie, can participate in the Bernard Loiseau Culinary Festival as an island chef. Resort guests have the opportunity of attending a 6-course dinner prepared by the participating chefs. DISCLOSURE: I attended this dinner as a guest of Constance Hotels but received no further remuneration and was not required to write a positive review. I retained full editorial control and all opinions are my own. And in other news… I am once again teaming up with Meeta to run a food styling and photography workshop – this time in glorious Vienna in the Spring! On 17-18 April We will be offering you two intensive and hands-on days with two instructors, talking you through the techy bits of how to get the best out of your camera, as well as the art of food styling and the power of Lightroom. I will be presenting a session on low-light restaurant photography and there will be plenty of hands-on styling exercises throughout, with me and Meeta on hand to answer questions and offer guidance as you style and shoot. We will also be taking you to the famous Naschmarkt vintage market, so pack light – you’ll need space for all those awesome props! Registrations are now open – full details are available here. We hope to see you in Vienna! 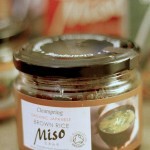 Clearspring miso tasting – and a new London workshop! Oh my goodness, what a fantastic place and such beautiful food! What world class cuisine – utterly stunning and delicious looking! Fabulous photograpy too as always Jeanne! Gorgeous food. The whole experience sounds amazing! Wow, that’s certainly exceptional looking food. And there’s that Vienna flier again! I’m sorely tempted.